It’s that time of year again--time to start getting ready for Halloween! Right now there is an awesome sale on Halloween Costumes going on and they have costumes for as low as $4.97! This Halloween Costume sale has tons of super cute costumes starting at only $4.97. They have Princess Costumes, Ninja Costumes, Superhero Costumes and so much more that your kids will love and at a price that you will love. 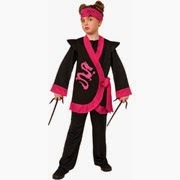 This Pink Ninja Costume is only $4.97 right now! This super cute Angel Costume is only $4.97 as well! This Rocket Raccoon Costume from Guardians of the Galaxy is only $9.88 right now! This adorable Cinderella Costume is also only $9.88 right now! This post may contain affiliate links. Read my disclosure policy here. FREE Mastermind Board Game, Just Pay Shipping! $15 Worth of Hasbro Game Coupons! $1/2 Starkist Tuna Pouch Coupon! *HOT* $1/1 Suave Product Coupon = FREE!! Rare $1/1 Enjoy Life Product Coupon! Today's Nichols Shopping Trip :: I Saved $88.03! Wal-Mart 2014 Holiday Layaway Program Begins! Rare 45¢/1 Daisy Brand Cottage Cheese Coupon! SavingStar :: Healthy Offer 20% Back on Avocados! 16 New Toy Coupons (Over $67 Worth of Savings)! thefrugalfamilylife.com Copyright 2011. Powered by Blogger.